Whose population growth has the most environmental impact? There are few if any environmental problems that are not made worse by the growth of the human population: depletion of fresh water, depletion of ocean fish stocks, depletion of oil and minerals, degradation of topsoil by farming, loss of biodiversity and others including the excessive carbon dioxide emissions that produce global warming. Detailed studies indicate that many countries already contain more people than can sustainably be supported by their land area (more below), and if we take no action, then the population in ever more countries will increase to that unsustainable point. Assuming nobody in their right mind wants to increase the human death rate, our only choice to tackle overpopulation is to find ways to reduce birth rates. Some people however feel uneasy about taking action to encourage lower birth rates. There are various reasons for feeling this way, including religious reasons, but one widely held reservation is that this amounts to “rich white men telling poor black women to have fewer babies”. It is often supposed that the main location of the problem of excessive population growth is in poor nations such as those of Africa, and that we have no right to preach to those people about their families. The figures analyzed here lead to a different conclusion: that the major impact of population growth on our planet comes from places that many people would not have thought of. This article compares population growth rates with the environmental impact per country, using CO2 emissions as an available and very relevant measure of impact. CO2 emissions reflect energy usage, likely to be roughly proportional to other factors like resource consumption that would affect the environment, and exact figures are not crucial here. The aim is simply to get a broad picture of the environmental impact of population growth in different countries. The table shows these figures. It includes both the world’s 20 most populous countries (current figures) and also the 20 countries with the highest CO2 emissions per person. These two sets overlap partially. For each country are listed recent estimates of the population (column 3), the annual % population growth (column 4), and their current annual absolute population increase per year (column 5, e.g. 6.5 million people/ year in China). In column 6 come the CO2 emissions per person per year (per capita per annum, or pc pa for short) in each country. These vary hugely, from 0.1 tonne of CO2 pc pa in Ethiopia to over 20 tonnes pc pa in Australia. Column 7 brings us the central theme of this article. We can get a relative measure of the environmental impact of each year’s extra citizens (the population increase), by multiplying that number by the CO2 emissions per person to give the resulting yearly increase in CO2 emission per country. The countries are listed in order of this overall impact. While we should bear in mind that every number in the table is an estimate and will have some margin of error, this column does seem informative and perhaps contains some surprises. It seems that the country whose population growth matters most for the planet is no poor, black nation at all, but the USA. Saudi Arabia and Australia may be two other surprises for many of us, to be found in the top 5 of this column (highlighted in red). The UK ranks at number 17, quite a high ranking among the world’s 196 countries, but still with an impact for its population growth of only a few percent of that for China or the USA. But, (one might object), this ranking is rather unfair on China and India, who are the other two members of the top five only because their actual populations are so large. They are both doing far better than some other countries in terms of low CO2 emissions per citizen. The last column provides a response to this concern by presenting the environmental impact of a country’s population growth, relative to its population size. Now there are no black populations at all in the top 5 (now highlighted in blue), but only some of the world’s richest nations. One can make more comparisons by browsing the table. For example it is noticeable that population change works out as having a negative environmental impact in some highly-emitting countries, because in these countries the population is currently falling. That is a good thing for the planet, although governments tend to see falling populations as a problem. But this is a “problem” that most or all nations will have to face for a period, to avert worse problems like hunger and resource wars, given that (as already mentioned,) actual populations in many countries are already higher than current estimates of carrying capacity, the number of humans that each land-area can support sustainably. If any readers are not yet familiar with these figures, see for example the Global Footprint Network http://www.footprintnetwork.org. More generally, we cannot stabilize humanity’s impact on the planetary ecosystem without stabilizing population. One key conclusion is that, from the viewpoint of global environmental impact, the country that most urgently needs to address the issue of its population growth, far from being “poor and black”, is the USA. Saudi Arabia and Australia are also in a position to make a contribution. China and India have already been working on this issue for some decades and do not need anyone to tell them to go on doing that. But the countries of Africa hardly feature at all in this league. We see only Egypt, Nigeria and the Democratic Republic of Congo in the top 20, ranking between 12th and 16th, and with the impact of the population growth for all three combined totalling less than one seventh that of the USA. So addressing global birth rates for the sake of the planet is not at all a question of rich white men telling poor black women to have fewer babies. It will certainly continue to be important to provide education and the means for couples in every country to avoid the many unwanted babies that are currently born. But what is more urgently needed than we may have realised is for many of those rich men and women to start to realise that they themselves need to consider having fewer babies. 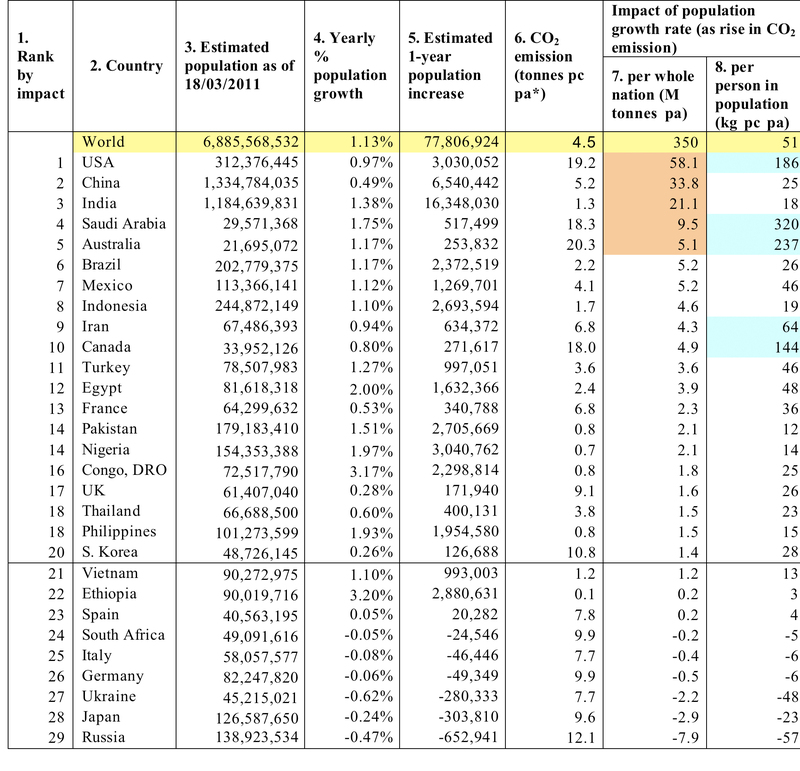 Table: “Environmental impact” of population growth in different countries, using CO2 emission as a simple measure of impact. *pc pa = per capita per annum (per person per year). Data in columns 3 and 4 are from the Geohive database (www.xist.org), originally from the American CIA. Column 5 is calculated by multiplying the figures from columns 3 and 4. Column 6 data are from US Department of Energy web pages: (http://tonto.eia.doe.gov/cfapps/ipdbproject/IEDIndex3.cfm?tid=90&pid=44&aid=8). 2008 figures are used for the CO2, since more recent figures may be distorted by the subsequent economic crises. Column 7 figures are obtained by multiplying columns 5 and 6, and column 8 by multiplying 4 and 6. A line indicates the top 20 countries by “population growth impact”. See text for further explanation.